You may have already noticed by now, but late last Friday night Omake Theater had a huge website overhaul. The domain was moved over to a faster and more stable web server. This new server also houses a brand new Omake Theater website that was built from the ground up. 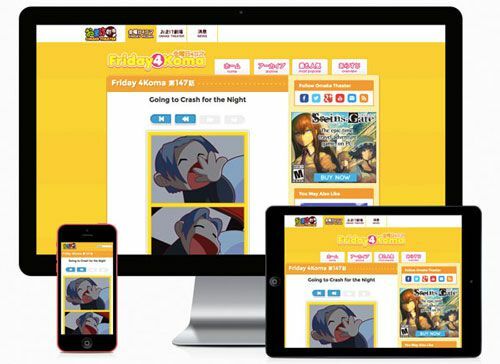 The Omake Theater website is now fully responsive. What this means is that whether you are viewing the site on a desktop, laptop, tablet, or smartphone the site’s layout will automatically scale and restructure itself in order to cleanly accommodate your platform of choice. Pages now load much faster. Content pages on the old Omake Theater website averaged about 3.5 seconds to load. Pages on the new site have an average load time of between 1 – 1.5 seconds. This is a speed increase of almost 200%. Each section of Omake Theater now has its own color theme. 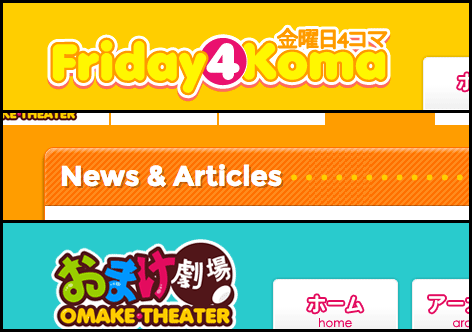 The main site and news sections are still orange, Friday 4Komas are now yellow, and the video section, a.k.a. Omake Theater, is colored teal. Also, all of the future website content will receive their own unique color palettes, as well. This gives each section a unique feel while still keeping it part of the site as a whole. I was finally able to implement tags for every new post on the site. This will make it easier to find similar and relevant content for individual posts throughout the site. Did you enjoy the latest installment of Purple Hates Orange? Why not take a look at every installment in the series? Tags are not global. If you click the tag for ‘rainbow’ under Friday 4Koma, don’t expect any Omake Theater videos to show up in the results. This was intentional. It helps to keep each category neatly contained within their very own virtual mini-sites. If you are on your desktop (laptop, too) and you see these navigation buttons on a page, that means you can easily navigate forward and backwards through those archives with only your keyboard. This means you could start at the very first Friday 4Koma and continue to the latest installment without ever touching your mouse. There are a lot of other cosmetic and functional changes through the site, but the ones mentioned above are the most prevalent. I hope that you will enjoy the brand website design and that it helps improve your overall Omake Theater website experience.